KUWAIT: Kuwait will host the World Islamic Financing Conference, organized by Kuwait Central Bank (CBK) and the International Monetary Fund (IMF), with the participation of the IMF Center for Financing and Economy in the Middle East and Thomson Reuters as strategic partner for knowledge. The conference will be held on November 11, 2015 under the patronage of His Highness the Amir Sheikh Sabah Al-Ahmad Al-Jaber Al-Sabah. 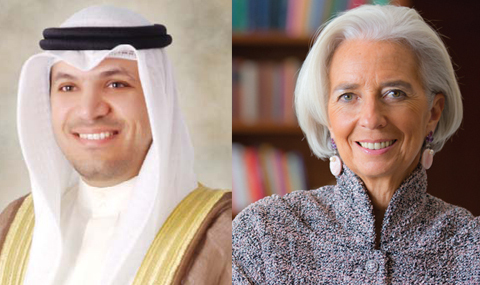 This announcement was made by CBK Governor Mohammad Al-Hashel and said the conference will see high ranking international attendance of decision makers headed by Christine Lagarde, Director General of IMF and senior IMF employers and experts around the world. Several finance ministers, Central Bank Governors, their deputies and representatives in many countries are expected to attend the event. There will also be presence of International Economic Establishments that belong to the United Nations and Regional Organizations in addition to experts and academics. Hashel said the conference will discuss many aspects in the field of Islamic finance industry starting with the growing development in Islamic Finance Industry and the wide ranging growth opportunities it has in world markets and new regions. These are ambitions boosted by features of Islamic financing that relies on the sharing profits and losses principle, as well as linking the purposes of this financing with the activities of real economy, that in addition to the capabilities and advantages the Islamic financing provides in meeting the various financing needs for countries, individuals and establishments, which itself has become among the factors that form supporting elements for major growth in demanding Islamic financing. He said that such view for future aspirations of Islamic Financing Industry, which appeared following the world financial crises in particular, and this made many countries to boost their capabilities and develop the Islamic financing industry in them and seeking to build an integrated infrastructure through working developing their systems and laws to attract banks and other Islamic finance establishments to operate in their markets. Other topics to be discussed by the conference is the financial inclusion issue in the field of Islamic Financial Services through the discussion of means of supporting financing individuals, small and medium establishments, within the framework of the importance of the role those establishments are playing at the economic and social levels. The conference will also discuss Islamic Sukouk and other long term financing means which boost financial sources for Islamic banks that can be directed to finance to infrastructure projects in addition to investment projects and support the sustainable development.